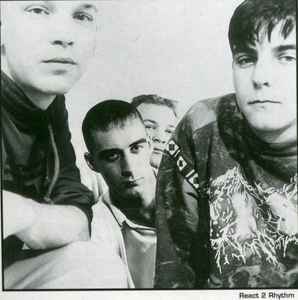 React 2 Rhythm appeared on the West London scene in the late 1980's releasing their first single" Rhythm Addiction" on William Orbits' "Guerilla Records" label , complete with a W.O. remix and a mix by Sugar J. & F.C. Harmony. Next came "Intoxication" , the original mix , released as part of a Guerilla records compilation "Guerilla Grooves". This dub fuelled track spawned many remixes , firstly Leftfields' acclaimed Clubfield & Dubfield mixes , then followed mixes from such luminaries as Justin Robertson , John Digweed & Nick Muir , D -Fex and Danny Howells & Shango . At the beginning of the 1990's the band released their album "Whatever You Dream", promoting it with appearances at clubs around the country including the newly opened Ministry Of Sound in London and the Orbit in Leeds, even travelling as far as Switzerland and Los Angeles. More remixes followed on from the album , the title track "Whatever You Dream" was given a seeing to by label mates D.O.P.,then by Chad Jackson and again William Orbit. One of the more lyrical tracks of the album "All Or Nothing" was given an American house treatment by the now legendary Danny Tenaglia , and "I Know You Like It" got a work over by Fabio Paras. During 1990 and 1991 Rich and Dij also produced a number of singles for Guerilla Records including Drum Clubs' "U Make Me Feel So Good" , 2 Shiny Heads' "Let Go", Euphorias' "Mercurial" and Spookys' "Dont Panic". One last R2R record was made , "I Want You" ,which was released as a promo single in 1992. By the end of 1992 it was all over, the band split. Andy and Ray went on to make a single together and although Rich and Dij carried on producing as Ernie & Bert there were no more R2R releases .